I learned today’s easy kitchen hack from Fresh & Easy. Did you know that you could freeze fresh ginger? When you buy a knob of fresh ginger, just peel it and then freeze it. Frozen ginger grates beautifully. It also lasts longer when it is frozen. This is a sponsored post on behalf of Fresh & Easy. All opinions are 100% mine. I love to collect kitchen hacks the way some people collect coins. I save them, organize them, and love to share them with my readers. And thanks to Pinterest, I have an easy way to find what I used to jot down on scraps of paper! The skin is so thin that I just used the tip of a spoon to get around the nooks and crannies without wasting any ginger. Before discarding the peels, put a few down your garbage disposal to make the house smell great. You can also use the peels to make a foot soak. I like to freeze fresh fruits and vegetables to use in my smoothies. Now it is easy to add a little bit of frozen ginger too. 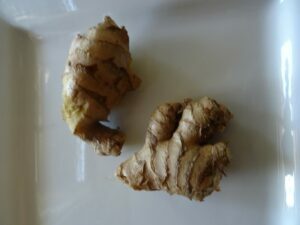 The ginger plant has a pungent, spicy taste that is used as a staple flavoring in many cuisines. I like to use it in stir-fry recipes. Now that the holidays are coming, I want to try making candied ginger. Have you tried making this at home? In addition, ginger may help relieve nausea and morning sickness. Drinking ginger tea for an upset stomach is a time-tested remedy going back to grandma’s day. Now ginger is not the prettiest of roots. I think it looks like monster toes. 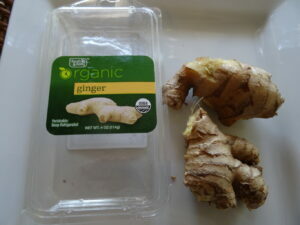 These two knobs of fresh ginger that I purchased at Fresh & Easy will last me a long time. If you strive to serve fresh food to your family but are time-crunched like most of us, Fresh & Easy Neighborhood Markets can help you to deliver what you need, right to the dinner table, without sacrificing on quality or price. 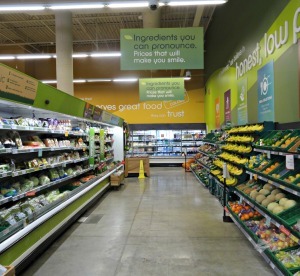 At Fresh & Easy, all of their products are guaranteed to be all natural and free of artificial colors, flavors and other additives that you do not want to have in the food that you feed to your family. For busy people on the go, they have freshly prepared food delivered every single morning. You can stop in for Grab-N-Go organic breakfast items, fully prepared organic dinners that can feed a family, Stone-baked artisan Take & Bake Pizzas, Fresh Fruit Smoothie Kits, and affordable meals for easy breakfasts, lunches, and dinners. As the holidays are approaching, you may want to incorporate food from Fresh & Easy into your dinner time “hacks” to help you to get everything done on your ever-growing “to-do” list. 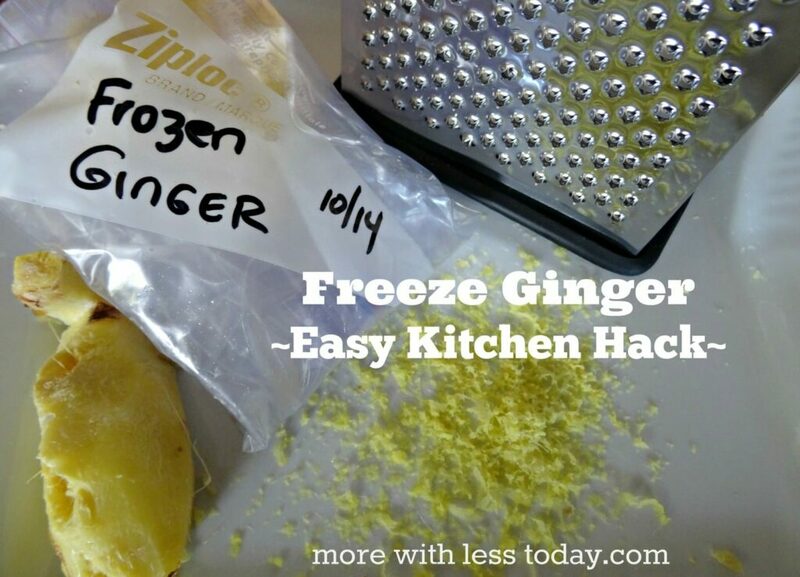 I learned about freezing ginger on the Fresh & Easy “Hacks of Life” Pinterest page. The page is packed with a TON of amazing and easy kitchen hacks. Be sure to follow it today. I am sure it will be a favorite resource for you too. For all you Pinterest pinners, be sure to enter Fresh & Easy’s Holiday Sweepstakes to win $150 in groceries or $300 cash. 3. Add #HacksSweepstakes to the description of your pin! GOOD LUCK! Winners chosen WEEKLY 10/10/14 – 12/31/14. (No minimum number of Pins required to enter.) Official Rules found here. Share Your Favorite Kitchen Hack! We would love to learn about your favorite way to make meal preparation easier! If you are on Pinterest and have a kitchen hack board, please send us the link so we can follow you.